SHE was the Scottish princess with Queen Elizabeth I for godmother, destined for a lifetime of exile in The Hague, and is the forgotten link between the Stuart and Hanoverian thrones. Now the legacy of Elizabeth Stuart, eldest daughter of King James VI and I, is being honoured by a unique new whisky made from a pioneering blend of Scotch and Dutch single malt whisky. Edinburgh-based Fusion Whisky said its new Winter Queen whisky “celebrated the story and honoured the memory” of Elizabeth Stuart, who was born in Fife in 1596, but spent most of life in The Hague. As eldest daughter to King James VI and I and Queen Anne of Denmark, Elizabeth was always destined for a place in the history books. While still a child, she was caught up in the web of intrigue during the infamous Gunpowder Plot. At 16 she was married to Elector Palatine Frederick V and the couple moved to Bohemia, where they reigned. But after a year the couple were besieged and forced to flee Prague, earning the couple the moniker, the Winter King and Queen. Elizabeth spent the next 40 years living in The Hague, campaigning for her lost lands and establishing a royal court that became an artistic and diplomatic hub whose influence extended across Europe. She also became a figurehead for the thousands of Scottish mercenaries based in the Netherlands. Dr Akkerman said that the thousands of letters Elizabeth wrote to statesmen and stateswomen, generals, lieutenants, ambassadors and other diplomats, showed the complex, witty and influential character of Elizabeth, whom history has largely overlooked. She added: “During her years in exile, she changed court culture in the Netherlands and was matriarch to a family that included artists, warriors, natural philosophers and one queen mother: George I was her grandson. The Winter Queen is the third character-led blend of international whisky launched by Fusion Whisky. Working in partnership with the acclaimed Adelphi, Fusion Whisky has established itself as a pioneer of premium blends made using Scotch and international whisky to honour remarkable Scots. Its iconic Glover whisky was made by blending Scotch with rare Hanyu whisky from Japan in celebration of Thomas Blake Glover, the so-called “Scottish samurai”. Glover, who is better known in his adopted Japan than in his homeland, played a critical role in the country’s industrialisation, and had a part in the foundation of Mitsubishi and Kirin Group. He was the first non-Japanese person to receive the Order of the Rising Sun, Japan’s highest civic honour. Last year the firm released The E&K whisky, which was made using Scotch and Indian whisky from Amrut Distillery in honour of the “Walking Viceroy”, Victor Alexander Bruce, 9th Earl of Elgin and 13th Earl of Kincardine. Bruce served as Viceroy of India under Queen Victoria in the late 19th century, and pushed for greater infrastructure and economic growth, including the construction of 4000 miles of railway during his term of office and linking all the major Indian cities for the first time, creating a railway network of more than 20,000 miles. 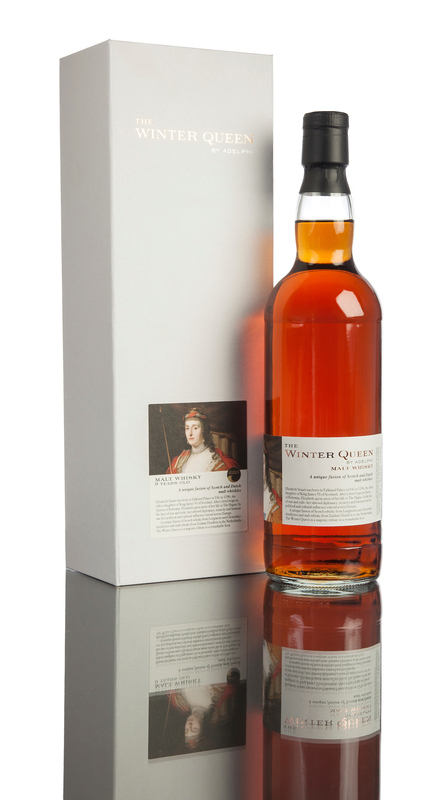 Fusion Whisky’s latest title, The Winter Queen, was made using Scotch from Longmorn and Glenrothes distilleries, blended with malt whisky from the renowned Dutch Distillery Zuidam. The recipe was created by Adelphi’s managing director and master blender Alex Bruce.